Is your hair visibly thinning? Restore tresses to their full potential with the Grow Gorgeous Thinning Hair Rescue Kit. Whether you’re looking for on-the-go essential hair care for lacking locks, or an intro to the GG Intense Range, this concentrated regime for hair and scalp is a savior for thinning hair. Containing a travel-sized Hair Density Shampoo Intense and Hair Density Conditioner Intense infused with Caffeine, Biotin and Hyaluronic Acid and a full-sized, highly-concentrated Hair Density Serum Intense. Use together for a visible improvement in hair appearance: density, fullness and thickness. Chic travel bag included. RRP $55 (Worth $82). Give your hair some serious care with this unique, advanced formula containing a complex blend of 7 technologies to help your hair appear visibly longer, thicker and fuller looking. Infused with Hyaluronic Acid to moisturize your scalp, it also contains Bio-Active Pea Sprout Complex helping to activate and improve hair density. With a high concentration of caffeine to really wake up the hair follicles plus a glucoside compound which actively increases hair density. Put some life back into those locks with our ultra-concentrated formula infused with Amino Acids, Biotin and B-vitamins to visibly increase hair density. Our advanced hair and scalp conditioning formula works to increase hair thickness and restore softness. An innovative form of hyaluronic acid is blended with amino acids, Biotin and B-vitamins to give hair a fuller appearance and dramatically improve hair density. Directions for use: Cleanse hair with the Hair Density Shampoo Intense and follow with the Hair Density Conditioner Intense to clean, nourish and thicken strands. Apply the Hair Density Serum Intense daily to complete the regime. The older I get the finer my hair seems. 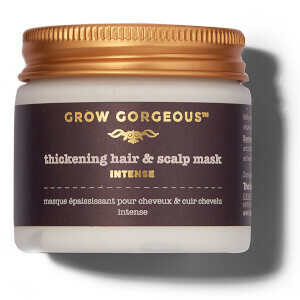 I am so happy to have found grow gorgeous products. I love the way my hair feels & smells as well as the fullness I get when I use these products. Thanks Grow Gorgeous. #Customer4Life.